Have you heard about the Stamp of the Month Club here at Stampin365.com? Every month, I choose a current stamp set and create four original card designs. Members receive everything they need to create the cards, including the stamp set, paper supplies and envelopes, all pre-cut and ready to make- they just add the ink! For October, I’ve chosen the “Happy Scenes” stamp set. 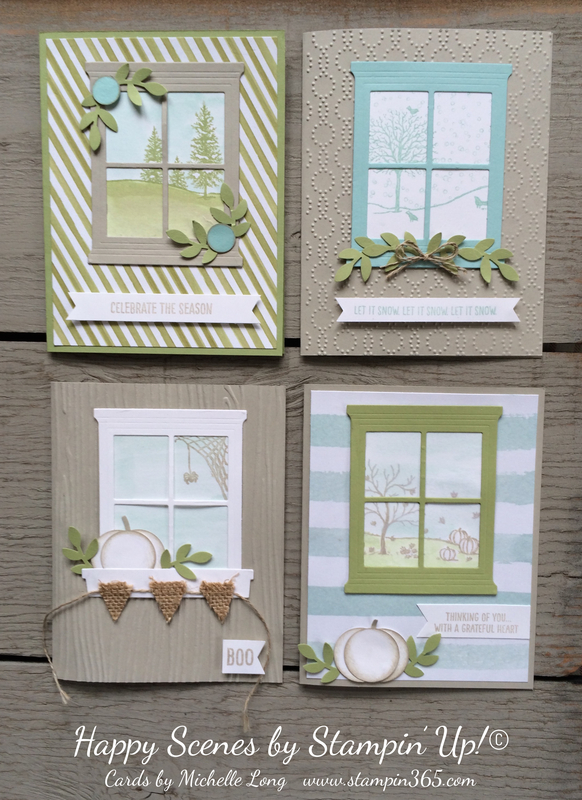 The four cards feature fall and winter scenes, but the little tree and birdies in the set can easily extend into spring and summer. To learn more about the Stamp of the Month Club, click here. If you would like to join in on the fun, contact me at stampin365@gmail.com by the 20th of the month. Also, leave me a comment and let me know what you think! The Happy Scenes stamp set is available as a bundle with the Heart and Home Thinlits Dies. Customers save 15% when they purchase the bundle. Stamp of the Month Club members are welcome to add the dies for just $13.75 more. This is optional and not necessary to complete the cards. If you would like to add this option, email me at stampin365@gmail.com. That is so nice to hear, Mary Ellen! I’ve had so much fun with this bundle and I know you will be so happy with it! Don’t you just love this set? You did beautiful cards with it. Thanks for sharing! Yes, I do, Mary! Thank you for a lovely comment- I love sharing! Lovely cards Michelle, a great variety, lots of pretty elements. Thank you so much, Helen, I’m glad you like them. Just found your site. So sorry I missed this month’s club. I love this set. These cards are beautiful. Thank you so much. Your comment started me thinking, and I decided to make some of the past months (including this one) available to purchase. If you are interested, send me an email and let me know. Have a wonderful day! I don’t understand exactly what comes in the package… it says “the stamp set, paper supplies and envelopes”. What about the ink, etc. The pictures on the bottom of the page confused me; are those items included? Sorry, I guess I’m just kinda slow…. Hi, Lisa, thank you for asking and I’m so sorry the supply list at the bottom of the page confused you. That is a list of everything used to make the cards, but not everything in the kit. The supply list is there for people who are not in the club and would like to know how to make the cards. I pre-cut, pre-punch, & pre-emboss everything so the punches and embossing folders you see in the list are what I use to put the kit together, but are not included. Also, stamp pads are not included. As the paragraph above mentions, club members add the ink. Things like aqua painters and adhesive are also not in the kit. Hope that helps clear things up. Have a wonderful day! Your club sounds awsome. However, I am retired and on a tight budget. Can you tell me what the cost is for the kits each month? I have scrapped for many years but am just getting into serious card making and I love Stamping Up products.